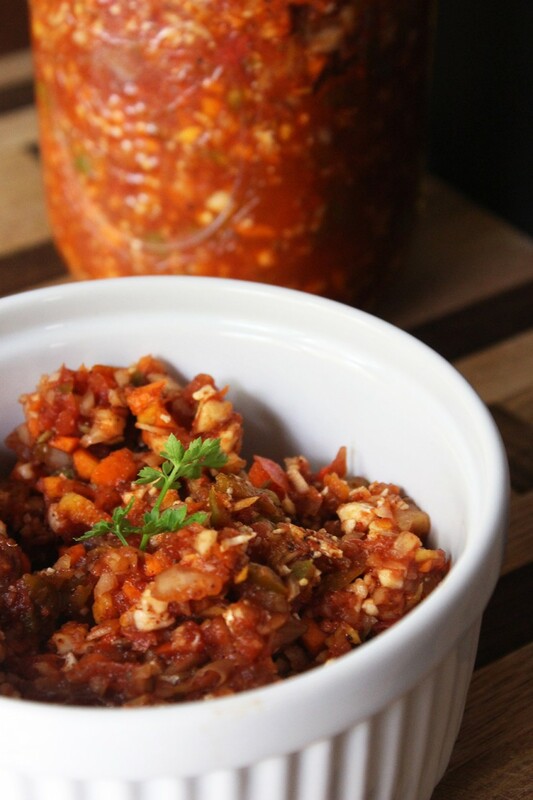 A sweet, spicy and savory fermented chili made purely from fresh fragrant spices, herbs and veggies. 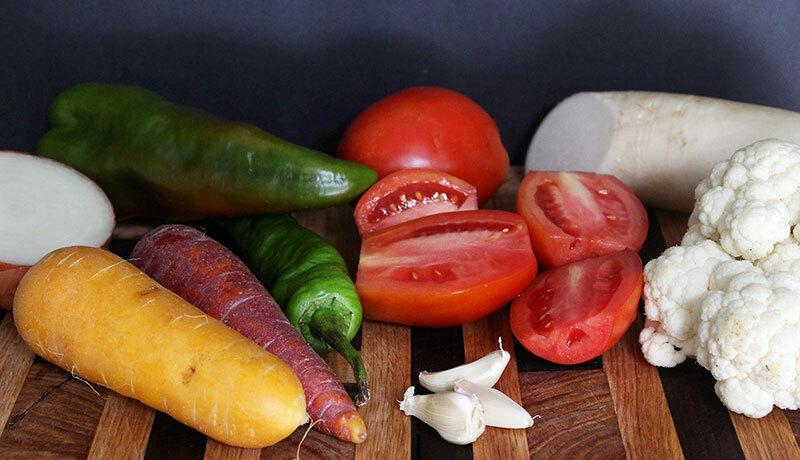 In this ferment we bring together carrots, cauliflower, daikon radish, tomatoes, and red bell peppers to take on the texture of chili. Add to that the Anaheim peppers, garlic, onion, smoked paprika, celery seed, chili powder and cumin. This is one of the most flavorful ferments I’ve ever had, it has this spicy kick that leaves your mouth feeling fresh and invigorated. Normally I can’t even get Dominick to stomach the smell of fermented foods, let alone eat them. But because this ferment is sweet, spicy, and was laid over a bed of rice and lentils, he couldn’t taste that classic fermented taste. I also agree the sour taste of fermented veggies can be overwhelming, it is what turns most people off to fermented foods. But like anything, flavors can be masked and manipulated. 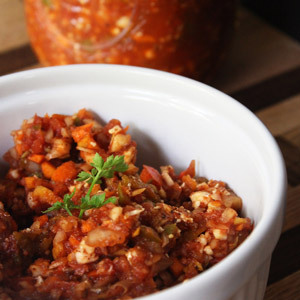 Adding this veggie ferment to rice heats it all up, bringing back those warm chili memories. The spice in the chili also helps heat things up a bit. It is so flavorful that the base can be left plain, wether its rice, beans, lentils, or whatever grain/legume you prefer. I also didn’t mind eating the ferment by itself, especially on a hot day. I grabbed the last tomatoes of the season last week, which was pretty sad, but luckily we have a hydroponic grower that grows all sorts of tomatoes during the winter…phew. If all the local tomatoes are gone by the time you read this, you can use sun-dried tomatoes; and rehydrate them in just enough water to cover them. The tomato juice is part of the brine, so when using sun-dried tomatoes you would just add the soak water. You could roughly chop all the vegetables and mash them into a jar as-is, or you can process it all together in a food processor. Either way the spices get added to the mix. 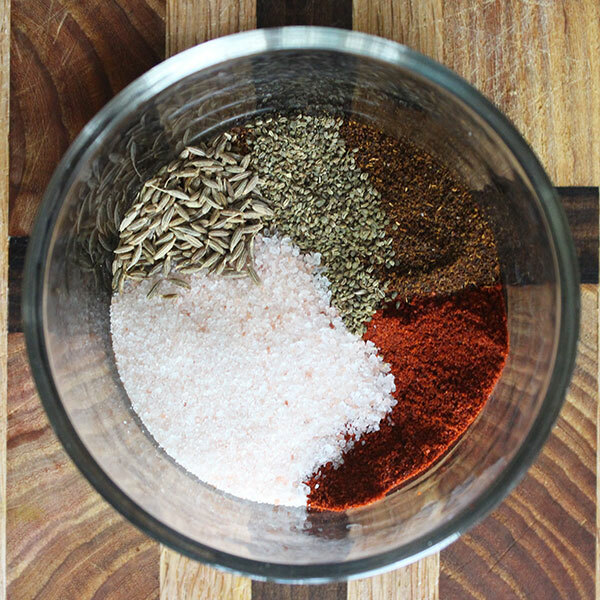 This is just an example of a chili spice combination; paprika, chili powder, cumin, celery seed, and sea salt. You could add any flavor profile you desire. I sometimes like to add turmeric, black peppercorn, ginger, cilantro and coriander. I used celery seed because I didn’t have any more fresh celery. It is ideal to have about 2 tbsp of salt per quart sized jar. Celtic sea salt works the best for keeping veggies firm during the fermentation process. In order for this ferment to work a sugar must be added to feed the lactic acid bacteria, hence the name lacto-ferment. In this ferment I added dates and processed them with the rest of the ingredients. I also thought about using raisins, or coconut sugar, but I didn’t have either, so I just went with what I had. 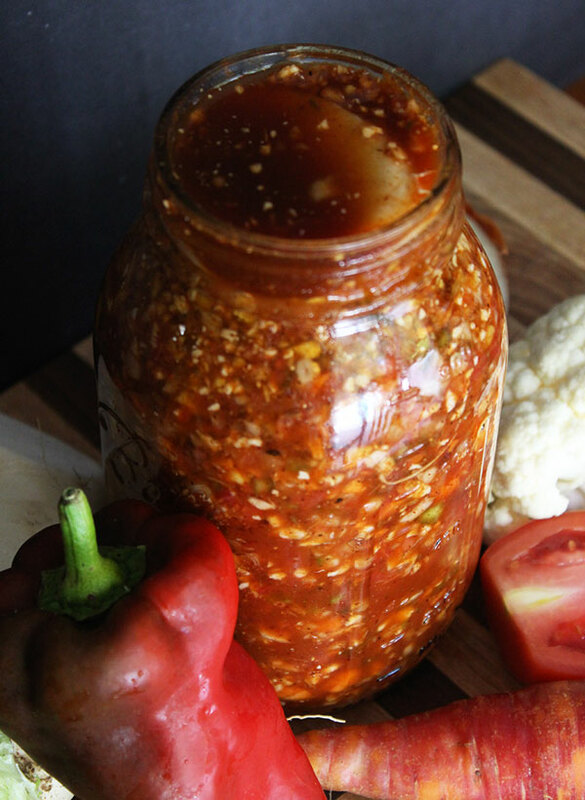 That is the beauty of this ferment, many of the ingredients can be substituted as long as they have a similar flavor and texture. Daikon radish can be replaced with more carrots, black radish, watermelon radish, salad turnips, kohlrabi, sun-chokes, etc. 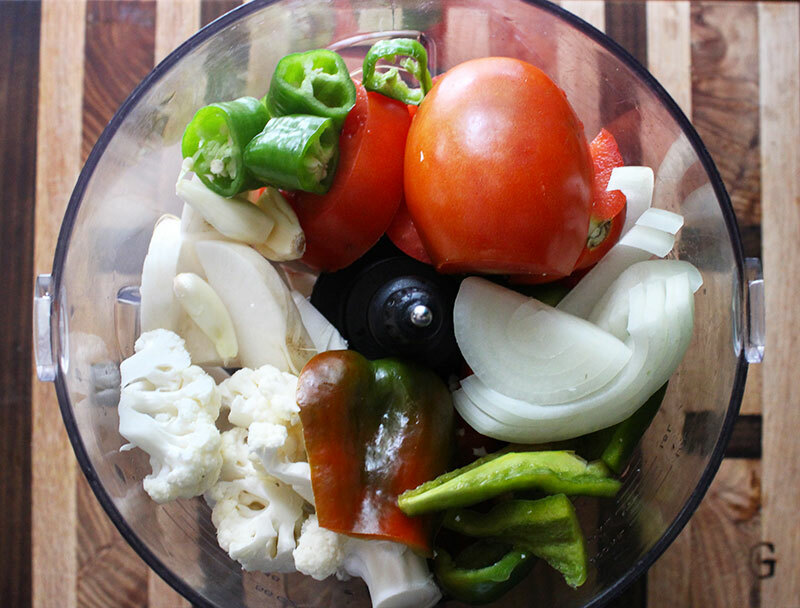 All you have to do is pack your chopped veggies into a sanitized quart-sized mason jar. To sanitize, either run the jar through the dishwasher, or boil it for about 5 minutes. Lastly you cover the jar with an airtight lid, and let it sit at room temperature for about 3-5 days. You’ll have to burp the jar if you don’t have an airlock lid. To check if this needs to be done, press the center of the lid, if its bulged up in the center that means carbon dioxide needs to be released so you don’t have a chili explosion. Just open the lid slowly to let the air escape. If there is that much activity you also may want to taste the chili to see if it’s to your liking. Or you can continue to ferment. They say the ferment is complete when the lactic acid bacteria has settled down, or the bubbles have stopped rapidly rising to the surface. This also means there are the most “LAB’s” present, aka probiotics, but lactic acid bacteria also causes that classic sour taste. So the more you ferment, the more sour it becomes. You’ll want to check it often to make sure it doesn’t get to sour for your taste. When you are satisfied, throw the jar into the refrigerator and the lactic acid bacteria growth will slow down to a halt, the sour taste should also diminish with time. 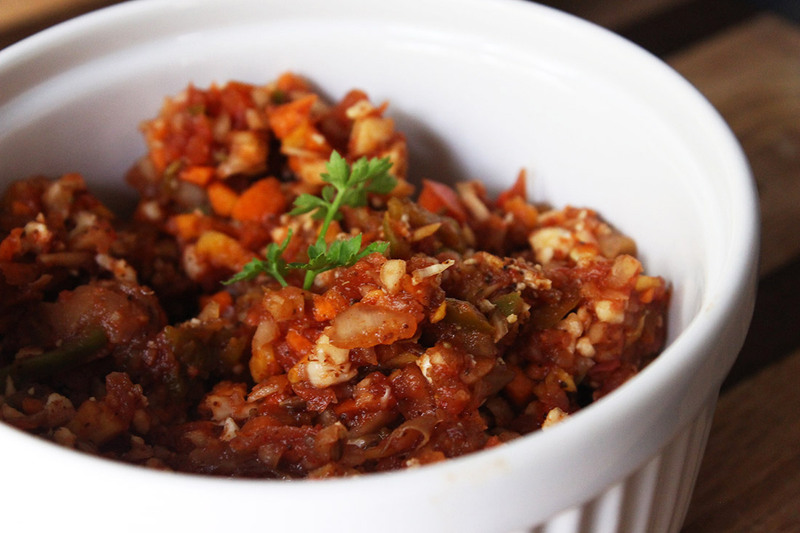 A sweet, spicy and and savory fermented chili made purely from veggies and spices. 1/4 cup sugar; ie. dates, raisins, coconut sugar, etc. Sanitize a quart-sized mason jar. 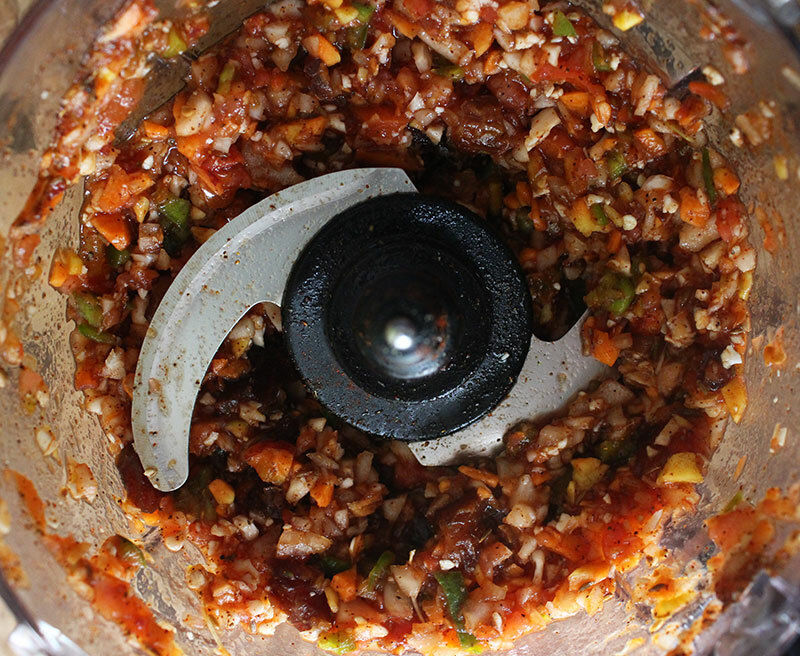 Put all of the ingredients into a food processor and process until veggies are desired size. Pack the veggies tightly into jar. The liquid should be covering all the veggies. If not add a little purified water. Add a slice of daikon radish; or carrot logs, on top to block the veggie pieces from coming above the liquid, aka the brine. Cover the ferment with an air-tight lid and let sit for 3-5 days. If the lid bulges in the middle after a day or two, you'll need to "burp" the lid to remove excess carbon dioxide. Try the chili periodically to see at what stage of the ferment you like it best. Store in the fridge to stop the fermentation and to reduce the sour lactic acid taste. The ferment will be its most flavorful 2-3 days after being put in the fridge. *fresh tomatoes can be replaced with 1 cup sun-dried tomatoes; rehydrated. Use the soak water as part of the brine in the ferment. Store up to 3 months in the fridge. I will do it, thanks! Hi there! I don’t see where or at what point you used probiotics and how much. Could you let me know? Thanks!